Incredibly fast servers. Definitely in the top 5% among all shared hosts that I've tested so far. Downtimes are practically non-existent, thanks to StorPool-powered 'self-healing' servers. Technical support is blazing fast, efficient, knowledgeable, helpful and extremely transparent. Not the cheapest at first, but regular (renewal) prices are cheaper than many other shared hosts. I've been using MDDHosting since 2011. During all this time, they've gone through many changes when it comes to their hosting plans, server specifications, and website design. One thing has been constant throughout all these years, however. Quality of support. Their technical support, especially, is one of the best in the shared hosting space, and that has always been the case since 2011. Over the years, they've upgraded their servers with newer, faster and more capable hardware, expanded their team to include more support staff, and introduced a plethora of new (and actually useful) features like Let's Encrypt, LiteSpeed Cache support, and StorPool-powered servers with a 1000% uptime guaranty (not a typo). If you're interested in signing up with them, this entirely revamped version of my MDDHosting review will help you gauge how well they do in areas like site speed, uptime, included features, performance/cost ratio, and quality of support. MDD's shared servers are incredibly fast, and consistently so. When it comes to performance, they'll definitely be in the top 5% of the web hosts that I've tested. As you can see in the screenshot above, a moderately heavy (but well-optimized) page loaded in just over 400 ms, which is a really great result that you don't usually achieve on most other shared hosts' servers. LiteSpeed Web Server, along with support for the LiteSpeed Cache module, which is the fastest and best caching solution for WordPress, in my experience. Fully SSD-powered servers, resulting in fast I/O times. Support for the latest PHP version (7.2), which performs faster than even HHVM. StorPool storage platform allows user data to be stored in multiple drives at the same time, and the distributed nature of the platform ensures that the data can be accessed from multiple drives at the same time, thus hugely boosting I/O operations per second (they claim a 900% increase vs. non-redundant storage solutions). It shows that they give site speed a lot of importance when you consider that they offer LiteSpeed Cache support even for their cheapest plan, even when the LSCache Module likely costs additional money over the standard LiteSpeed web server license. It's also worth noting that they're extremely proactive when it comes to server performance. Over the last 8 years or so, they've upgraded all their servers quite a few times to allocate faster hardware and better or newer software, with an aim to improve performance and reliability even further. Don't just take my word for it when I say downtimes aren't even a thing with MDDHosting. The screenshot above shows the uptime stats for the last 30 days of one of my sites hosted on MDD. As you can see, the site in question has been up for almost 4,000 hours straight! That too could've been for just a few seconds instead of 1 minute as reported by the tool, as their test interval itself is 1 minute. There's also the chance that this minor slip-up was caused by either CloudFlare or some broader DNS issue. So, clearly, uptime is exceptional on MDDHosting. If you have a very valuable site that you want to host on an extremely reliable shared hosting platform, MDDHosting should be one of the first options that you consider. It shouldn't be a surprise, however, as they're the first host that I've seen offering a '1000% Uptime Guarantee'. They explain that they're able to guarantee such a hard-to-believe amount of uptime (which might even make people skeptical) because of their StorPool-powered 'cloud' hosting servers, which are 'self-healing', thanks to data redundancy. In simpler words, your website's data is mirrored across and served from multiple SSDs which are all interconnected and synced in real time. Whenever a particular drive fails, your site is instantly served from the other drives that also have your site's data. As you can see in the screenshot above, I've so far created a whopping 80 support tickets in my 8 years with MDDHosting. Unlike most other shared hosts, their technical support is super fast, even at 3AM in the night (their time). I've always gotten the first reply within 5 minutes or even less, and the whole issue sorted within an hour, mostly. It's worth noting that very few of these 80 tickets were about any issues specifically related to their service. In most cases, I opened a ticket to get a technical query answered by their capable support team, or just for advice related to things like site speed and SSL, in the initial years with them. In some cases, I created the tickets for issues caused by me, such as a HTTPS to HTTP redirect loop, non-renewal of a Let's Encrypt SSL certificate due to a .htaccess settings mess up, etc. At the beginning, and I'm talking about when I first signed up 8 years ago, most technical support queries would be answered by the extremely knowledgable owner of MDDHosting, Michael Denney, himself. But nowadays, they've also got a very capable tech support team who are just as efficient and joy to deal with. In addition to their 24 x 7 x 365 tech support via email and support tickets, there's also live chat support. They also offer phone assistance for billing and sales related queries from 8AM to 4PM ET, Monday to Friday. Update: they've recently upgraded all hardware and reduced the prices quite a bit. The screenshot above shows the cost and specs of current cloud hosting plans from MDDHosting. Now, this is an area where you can be slightly unhappy with them, because their plans are not the cheapest around. Although, on the plus side, if you were looking at their cheapest plan called 'Cloud Starter', even though it comes with just 0.5 CPU cores of processing power, it doesn't actually have a limit on the number of domains that you can host on it. This is uncommon for shared hosting plans at this price point, as many other hosts allow you to host only a single website on their starter plans, even when they're offering more server resources. However, I'd recommend the 'Cloud 1' plan for most people with medium-to-high traffic websites. As it's always good to have a bit of headroom when it comes to web hosting. It also comes with 'unlimited' storage space (which just means that there isn't an arbitrary storage limit, but of course you can't expect to host terabytes of data on a $10/mo plan). An exclusive coupon for the readers of TechTage. Get 50% OFF on Cloud Hosting plans. One-time coupon for your first month. If your site runs on WordPress and is well optimized, the 1 Core and 1 GB of RAM allowance should be more than enough, especially considering how much of a difference the presence of LiteSpeed makes. If you're looking to spend even more and looking at their $19.99/mo plan, however, I would recommend ExonHost's $19.95/mo Turbo Diesel+ plan over that one (read my review of ExonHost). That's because it comes with 2x CPU cores & RAM, and more than 3x Entry Processes. I'm currently a user of that plan, and I'm extremely happy with its performance. Here are a few other points about MDDHosting that I couldn't write about in the previous sections. Endless upsells are a real pain with most cheap shared hosts, especially those owned by EIG, but that's not the case with MDD. They're extremely transparent right from when you first sign up with them. I don't remember them ever trying to sell me anything at all (irrespective of whether it's useless or not) since I first signed up with them. Many shared hosts either charge separately for offsite backups or charge when you need to restore a backup. MDD does neither, and you can restore the backups partially (file/folder level) or in full, from their offsite backup solution which keeps your entire site data stored for at least 7 days. If you're a CloudFlare user, you probably know that their performance-enhancing RailGun feature costs around $200/mo. You can get it for free if you host with MDDHosting, thanks to their partnership with CloudFlare. If you do utilize this rather advanced feature, the connections between your MDDHosting server (origin) and CloudFlare's CDN servers will be faster, resulting in a faster performance overall. Don't mind the ancient cPanel theme, I didn't have time to switch to the newer one yet. They offer both Let'sEncrypt and cPanel's very own AutoSSL for automatically installing SSLs for your domains, for free. It doesn't have any hassle of manual renewal, either, as it's renewed automatically as well. It's needless to say that I'm more than satisfied with MDDHosting's quality of service and features of their shared (cloud) hosting plans. Apart from the things that I've already mentioned, I especially like their strive to make their overall offering even better for the end users. It's not a surprise considering they mention in their 'about' page that they don't view their customers as dollar signs. It resulted in them upgrading their servers with new hardware and software whenever there's a new way to make them even faster, or even more reliable. It's definitely a welcome change in a world where most low-budget web hosts forget about customer satisfaction as soon as the money-back period is over. I hope my MDD Hosting review has offered you some practical insights about their service, and hopefully you're now less confused about their performance in various crucial areas of web hosting. If you do decide to sign up with them, you can take advantage of the coupon code - TECHTAGE50, which will give you an instant 50% discount on your first bill. Especially if you pay annually or biennially, this can save quite a bit of money when you sign up. You probably already heard about MDDHosting from me, as I just can’t resist myself praising these guys whenever I can. MDDHosting, founded in 2007 by Michael Denney, is a rock solid web host with unbelievably tremendous customer support. We’re hosted on MDDHosting since mid-2011, roughly for 4 years. In these 4 years, I haven’t felt like moving to another hosting company because I had zero problems with MDDHosting. 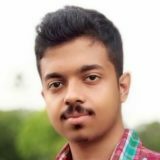 Now, I’m hosting my personal site, RohitPalit.com, on the same account and as usual impressed with its performance as well. Their servers are perfect for my WordPress blogs, as well as for our SMF forum. Keep reading to know why I love MDDHosting so much. That’s when I decided of not choosing another popular web host like BlueHost or InMotion Hosting. I was finally determined to switch to a much better host. A real web host offering high-quality service and one that values its customers. I stumbled upon WebHostingTalk, a great community consisting of highly-knowledgeable people. I eventually came to know about MDDHosting, as it was kind of hard not to, considering the amount of long, positive reviews floating around WHT. I had a brief conversation with owner Michael, and he answered the kind of technical queries to me about their service that would make HostGator or iPage people (or bots, they hire stupid bots too) stare at you for a while. So, without further delays, we moved to MDDHosting. As soon as our account was set up, Mike and co. effortlessly downloaded a huge backup from iPage and successfully moved our site to a relatively new server of theirs. As soon as our site started loading from the MDDHosting server, I could instantly feel the speed improvement. Our load times were halved. And MDDHosting’s 150ms average server response time was something I was not used to experiencing. The second best thing was the customer support. I mean, seriously, which web host’s technical support executive (in his right mind) answers support queries within 3 minutes at 1 A.M. ? MDDHosting’s support is second to none. You’ll get your query answered quickly unless you ask something stupid in the first place, even then you’ll probably get a reply sooner than you think. Third best thing was uptime. 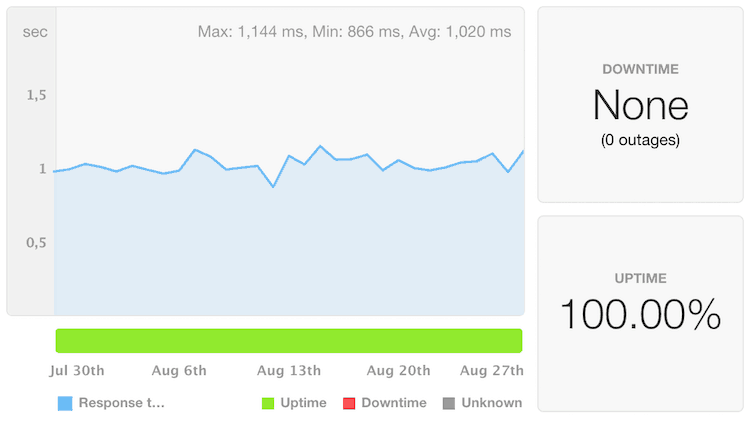 This year the uptime is around 99.98%, according to Pingdom. MDDHosting, as I feel, use their funds to improve their service quality by upgrading old servers and adding new ones and spending a high amount of money on customer support and maintenance, unlike other bigger providers who shell out most of their cash on advertising or affiliates (some of the bigger providers pay as much as $150 to affiliates per shared hosting sign-up worth a few dollars per month). LiteSpeed-powered Servers, running on CloudLinux. LiteSpeed is apparently up to 9 times faster than Apache web hosting and processes PHP 50% faster on a shared server. Every account has resource limits, so no one can hit the server’s maximum resource limits alone and slow down the whole server or even crash it. Most servers are equipped with a minimum of 24GB of RAM and Dual-Quad Core Intel Xeon Processors running at 2.4+ GHz. They place their servers in the Handy Networks datacenter in Denver, Colorado, United States. MySQL Concurrent Connections limit is 25 in shared plans and 50 in semi-dedicated plans. Given that each visitor’s connection with the server stays alive for as less as 200-300ms, you can safely assume that on a properly optimized WordPress blog, you can easily get 100 hits at any given instant and still not worry. We’ve once had 792 people online at our forum and still I didn’t notice even a slight bit of increase in load time. Daily backups. They backup your data everyday using R1Soft Continuous Data Protection Backups and keep each restoration point on their backup servers for 7 days. You can restore a backup anytime by logging into cPanel. Unlimited add-on domains (the domains you add after adding your primary domain). Latest versions of PHP & MySQL. Softaculous 1-click script installs. I have none, at the moment. I used to be unhappy about their SMTP mailing limit (200 emails/hour, and a fair-use limit of 2,000 emails/day). SMTP emails are required by softwares like WordPress and SMF (the ones that I use) to send emails to users to notify about various things (like email confirmation during new user registration). I don’t hit the limit anymore, but a while back, when our forum was at its peak, boiling with 25K+ members, it used to be a slight bottleneck. The reason they limit the no. of outbound emails on shared hosting is spam. The more bulk emails you let users send, the more chances of the entire mail server getting blacklisted. This, again, isn’t a big deal for 95% of the users. People who do need to send more emails in a month, should consider using an external SMTP Mail Service, such as Mandrill. If you need a reliable web host that cares about its customers for your next WordPress blog, or your next site in general, I recommend you to give these guys a try. There’s always a 30-days money-back guaranty, so you can always get your money refunded back to your account in case you’re not fully satisfied (which would be a rare case, really). They are costlier than your average ‘unlimited everything for $5’ host, but you won’t regret moving your sites to them for a bit more money, which would get you a much better service, overall. Their shared plans start from $7.50/month. You can, however, use the coupon ‘monster10’ to get a 10% recurring discount for the life your account, or the coupons ‘half-price’ and ‘WHT50’ to get an one-time 50% discount on any shared / semi-dedicated plan of your choice (I’m not sure about VPS and Dedicated Servers). MDDHosting offers a tremendous service, which you don’t usually get to experience at this price point. They’re one of the fastest shared hosts on the planet, and offer insanely good support. They’re always willing to assist you with anything and everything.